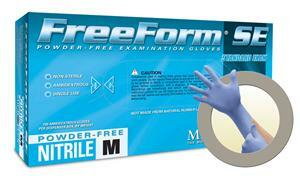 FreeForm SE Nitrile Gloves The most comfortable Nitrile glove you've ever worn! 18 months of research and development has yielded a super-soft Nitrile glove that offers features and benefits unrivaled by ANY existing Nitrile glove. A low modulus profile- similar to latex, allows FreeForm to conform to the hand allowing for optimal dexterity and reduced hand fatigue over long periods of wear. FreeForm SE also carries the same durability properties as conventional Nitrile gloves and maintains a broad resistance to chemical and biological hazards. Thickness: Cuff-4.3 mils, Palm-5.1 mils, Finger-6.3 mils, Length: 9.5" average. Non-sterile, latex-free.